Here is my perfect little world. 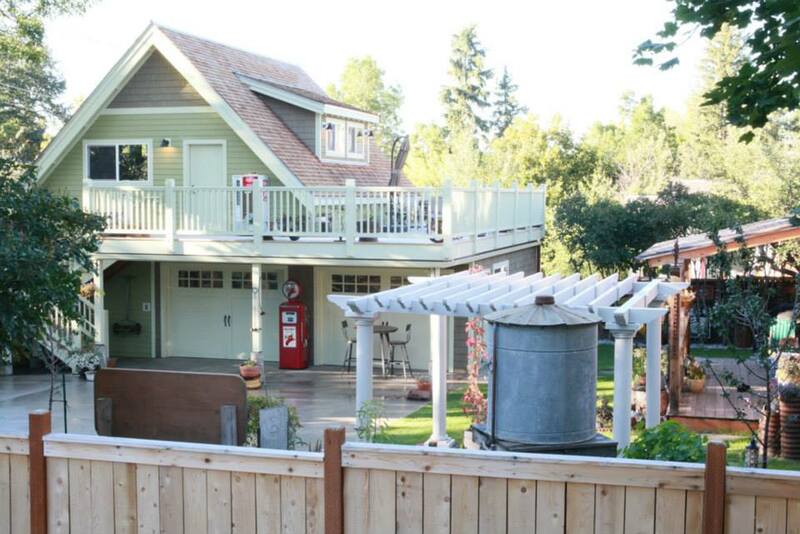 A 15 foot commute to work in the middle of “The Last Best Place” Bozeman, Montana. I couldn’t ask for anything more. Birth of a frame. At Strong Frames you work directly with me. Together we will design a frame that addresses all your priorities. Whether you know exactly what you want or have no idea at all. I will get the information I need from you to build exactly what you’re looking for, guaranteed!! See a detailed description of my order process here. 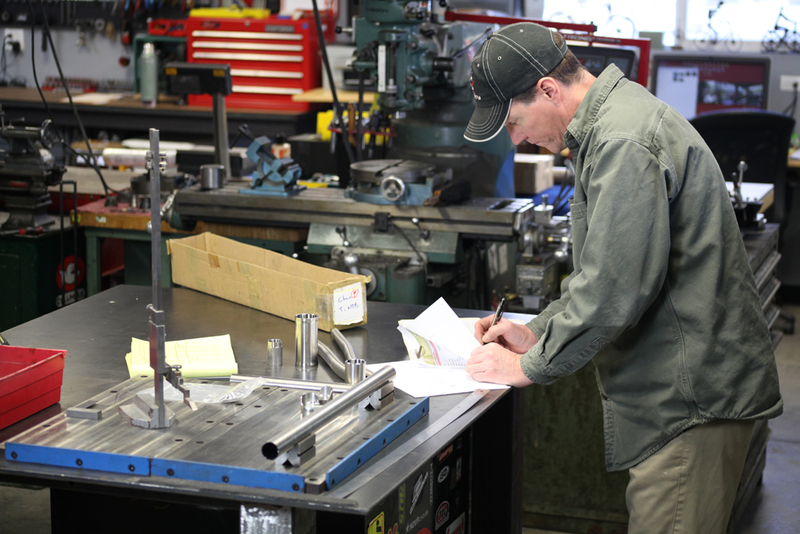 Your frame parts are ordered and stored in your box during the design process. When your turn comes, I’ll pull your box and that’s the only frame I’ll work on until it’s done. Your frame is drawn on BikeCAD Pro. 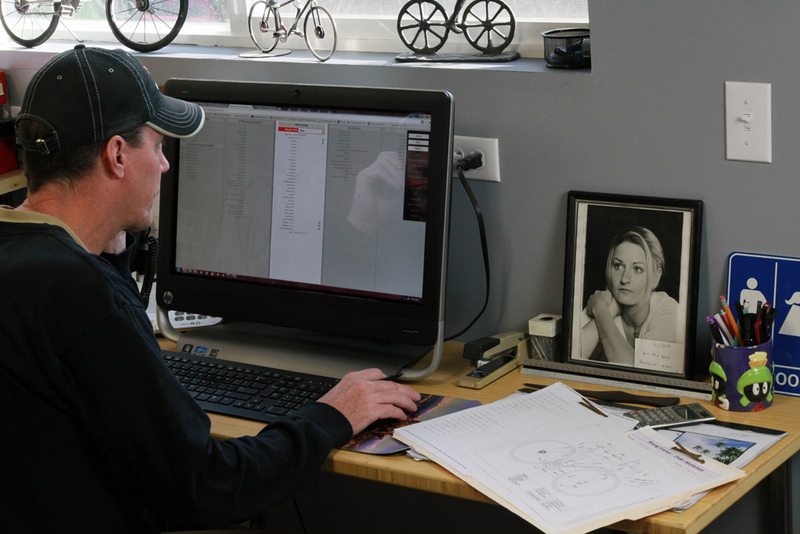 BikeCAD Pro allows us to design the frame elements we discuss in the design phase as well as incorporate all the parts that will be used when the bike is assembled. This guarantees that all touch points will fall where they have been designed to. To ensure accuracy, this drawing accompanies your frame throughout the building process along with your customer file. This cold saw easily makes precise square cuts without heat affecting even the thinnest tubing. This is especially important when working with titanium. 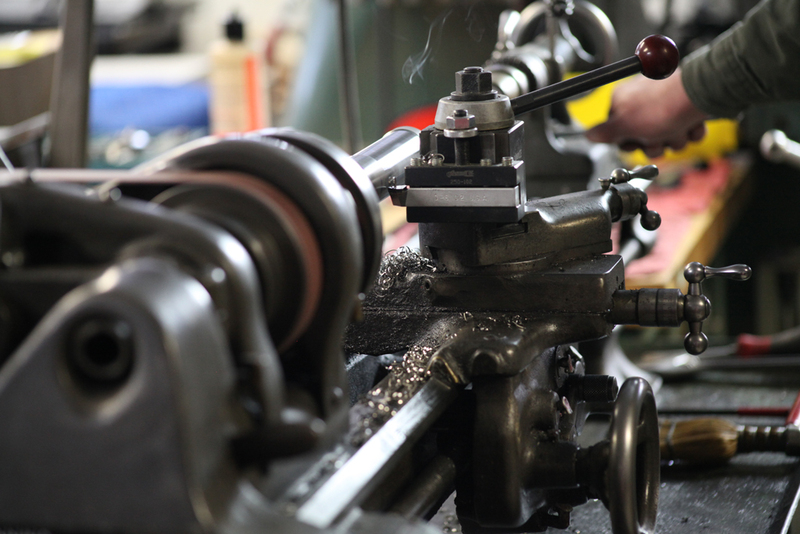 A view of the Anvil Main Tube Mitering fixture. 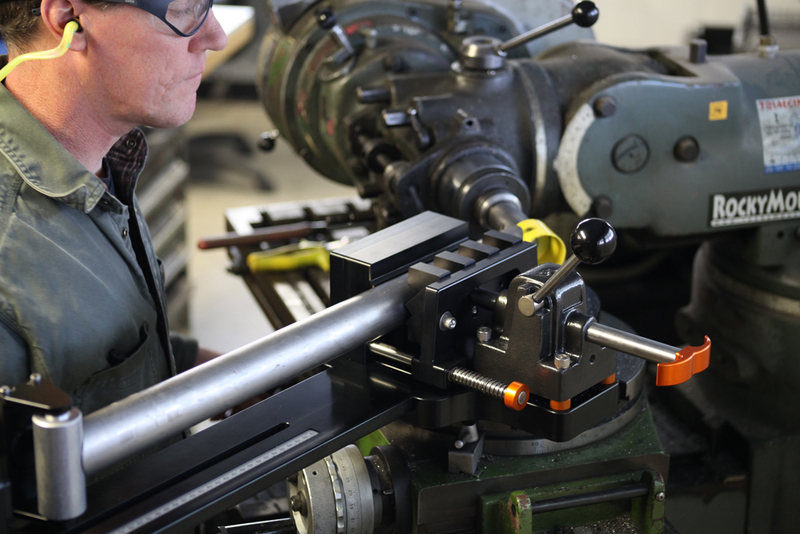 Several sets of interchangeable jaws, tube holders and dummy mandrels give the flexibility to miter a wide range of tube diameters and profiles. These jaws hold tubes very rigidly, which is a necessity when working with titanium and modern ultra-thin steels. Here is our Anvil seat stay fixture on a vertical mill. The fixture allows me to hold the stays in relation to each other and cut them both at the same time. I eccentrically machine all titanium head tubes. Removing excess material from the front saves weight and gives your frame a distinctive look. Here I am tacking a frame in my Anvil Super Master frame fixture. The fixture precisely holds frame geometry and sizing. The red hoses convey argon to the inside of the tubes. Known as internal (back) purging, this method is crucial for titanium welding. 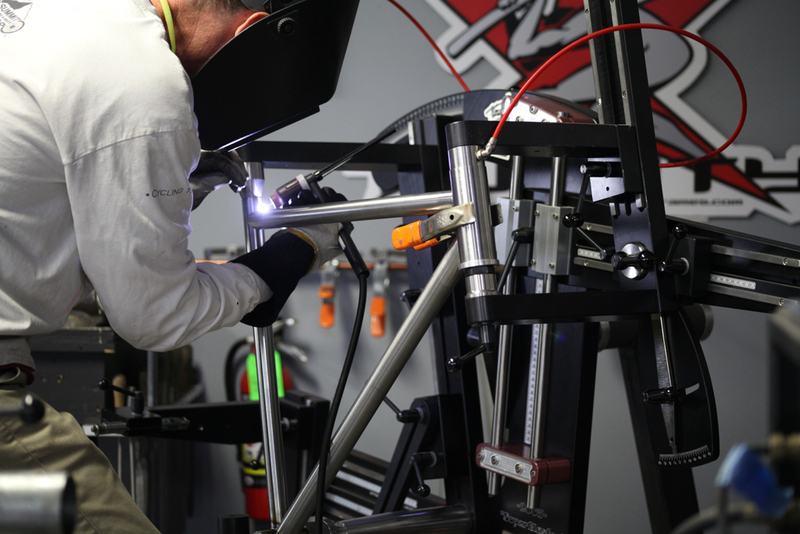 That’s me under the hood, welding a rear triangle together. Most builders align their frames after the welding has distorted them, this is known as ‘cold setting’. To minimize internal stresses (and get frames as straight as possible) I purposely misalign each frame when tacking, and then use a very specific welding sequence to bring the frame naturally into alignment. 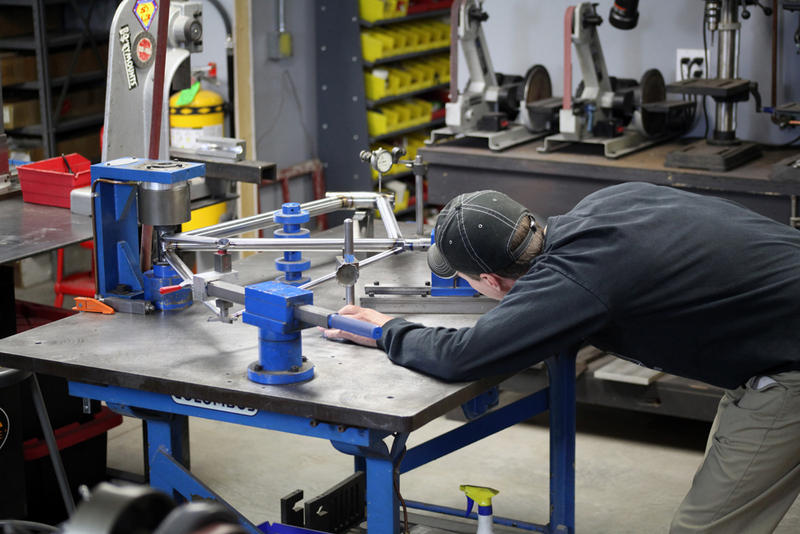 The frame gets closer and closer to alignment as each weld is laid. 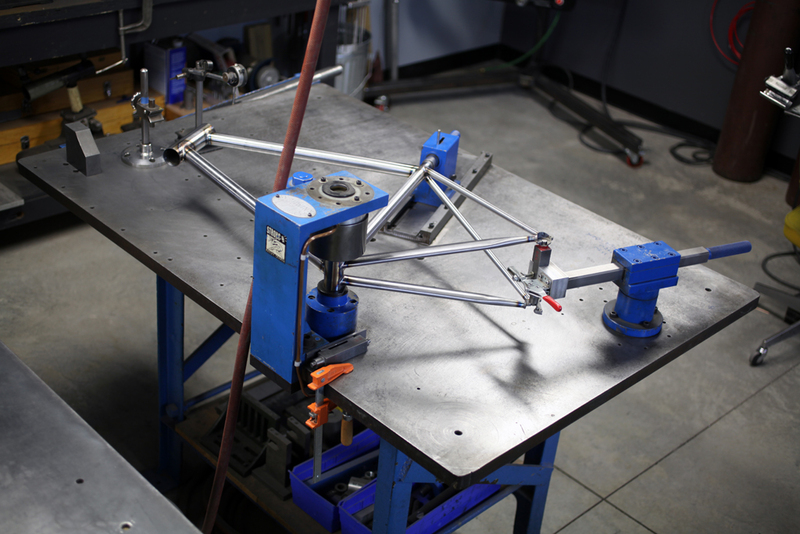 When the last weld is completed the frame will be straight, no cold setting required. 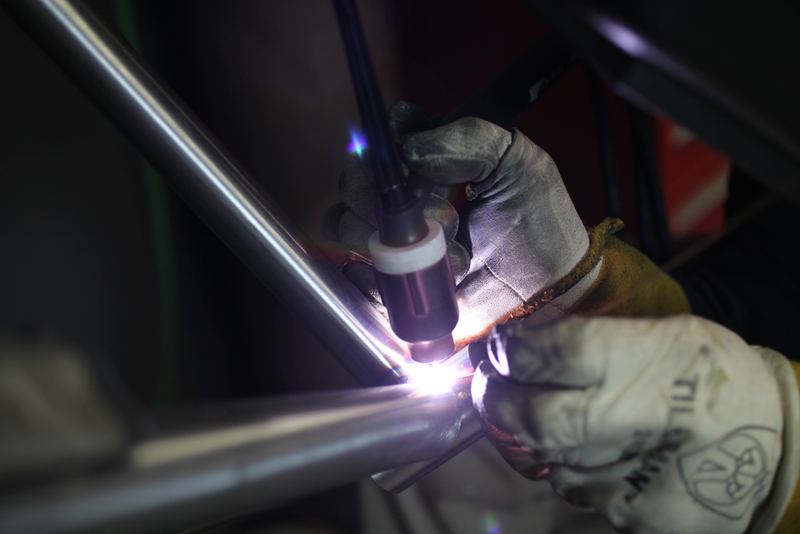 Here’s a close-up of TIG welding the down tube to the bottom bracket shell. For the geeks, TIG stands for Tungsten Inert Gas. The brightly glowing electrode is the tungsten, which provides the arc. The inert gas is argon, which after emerging from the pinkish colored gas lens forms a protective cloud (invisible) around the heated metal to prevent oxidation and contamination. 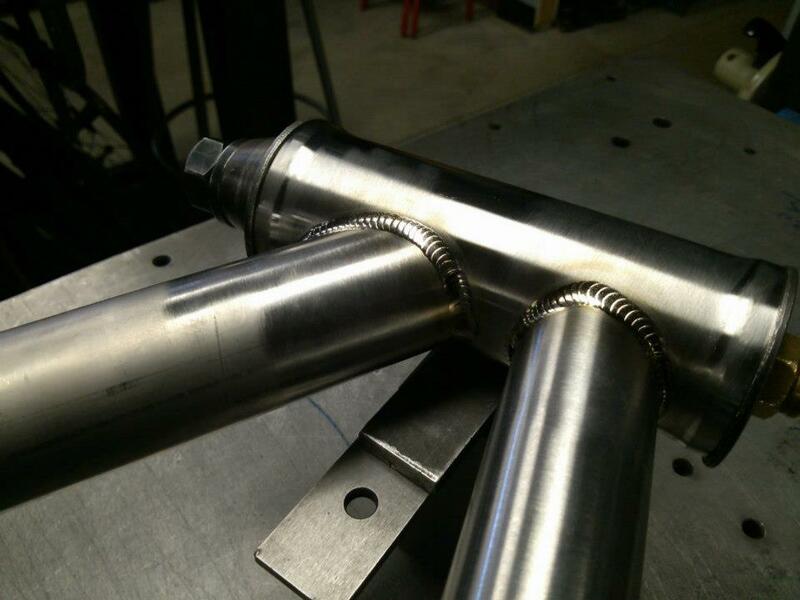 Here is a close up of a titanium headtube. It has taken many years and many frames to get to the point at which I could consistently produce welds of this aesthetic quality. Just because a weld is pretty doesn’t mean it’s strong, but if you know what you’re doing, a weld can be pretty and strong. Thousands of Paramount’s were straightened on this alignment plate before Schwinn closed its high-end Waterford factory. 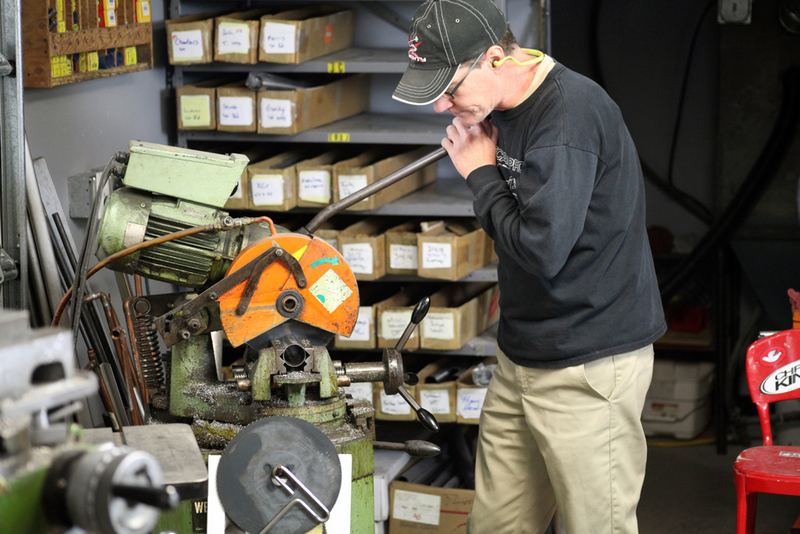 The plate is proofed regularly to be sure it’s just as accurate as the day it was machined. 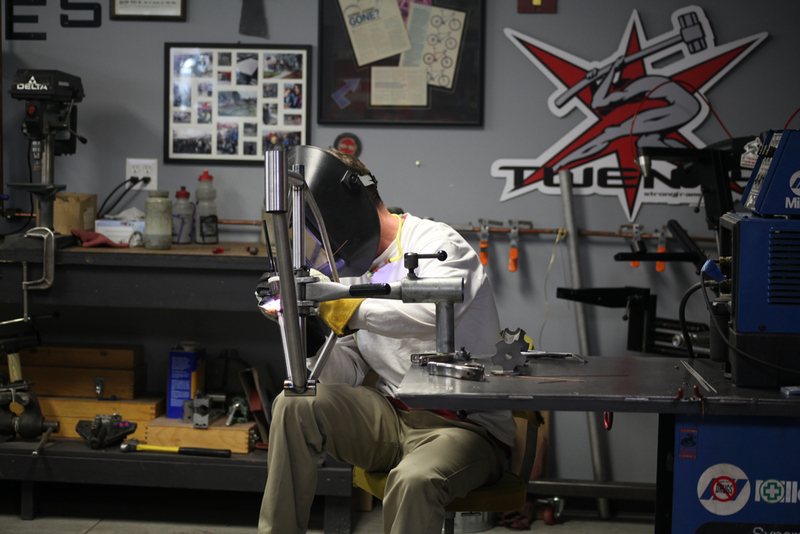 In this picture, I’m checking a frame’s head tube for twist. No one is pickier about a frames alignment than me. I want them straight, straighter than any rider would ever notice, straighter than they really need to be. It’s simply pride in craftsmanship. I may be known for TIG welding, but like any frame builder worth their salt I am adept at brazing as well. 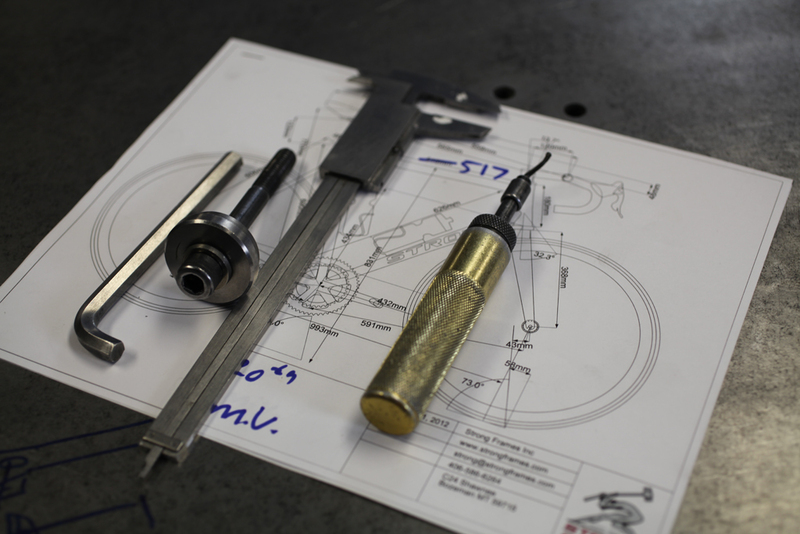 Cable stops, water bottle bosses and other small parts are silver brazed on all steel frames. 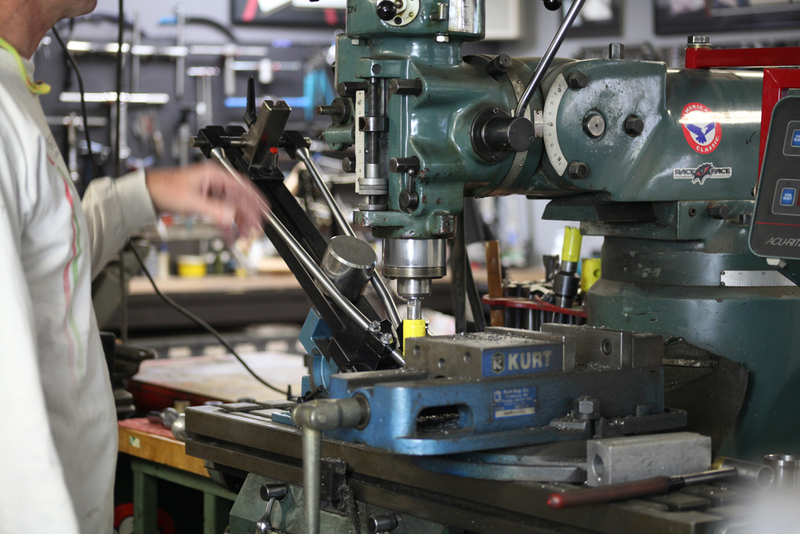 Here I am machining a head tube on a dedicated reamer/facer. An environmentally friendly cutting fluid is used for all of our operations. Another dedicated machine, “JoJo the little slotter that could” makes a perfect slot in the seat tube every time. 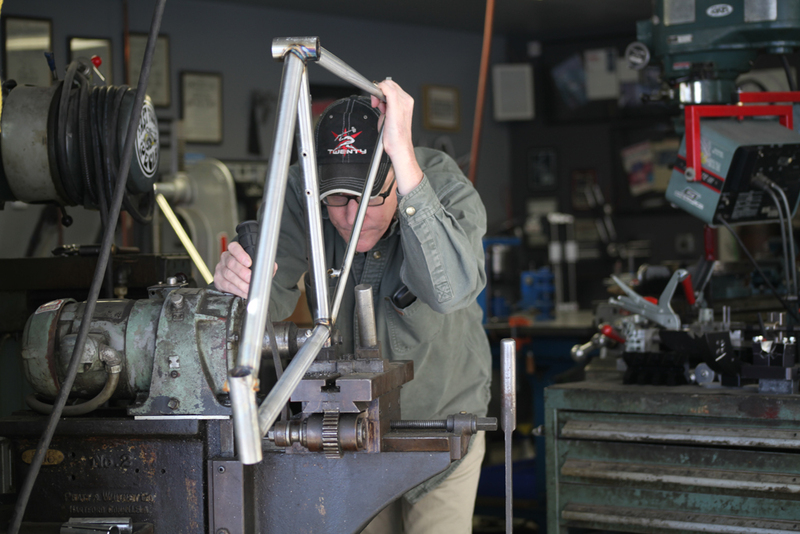 Attachment of the optional pewter head badge on custom frames is a memorial to the days when bikes weren’t mass-produced and builders were proud of their craft. 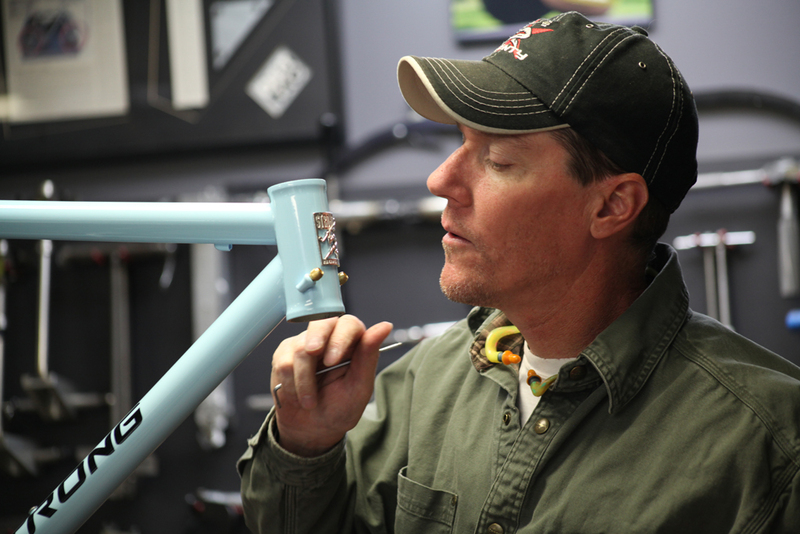 Complete bicycles will be professionally assembled at no additional charge. 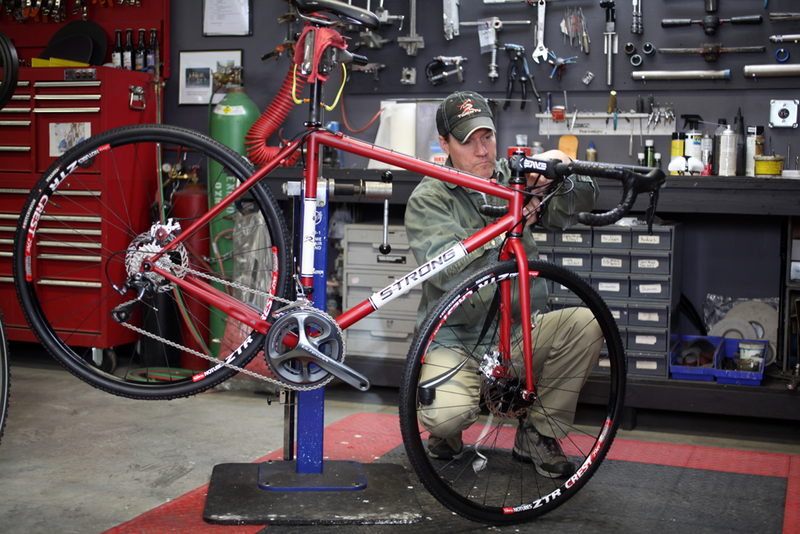 Once you receive your bike, a few minutes and some basic bicycle tools are all that is required to get you riding. Ship it! 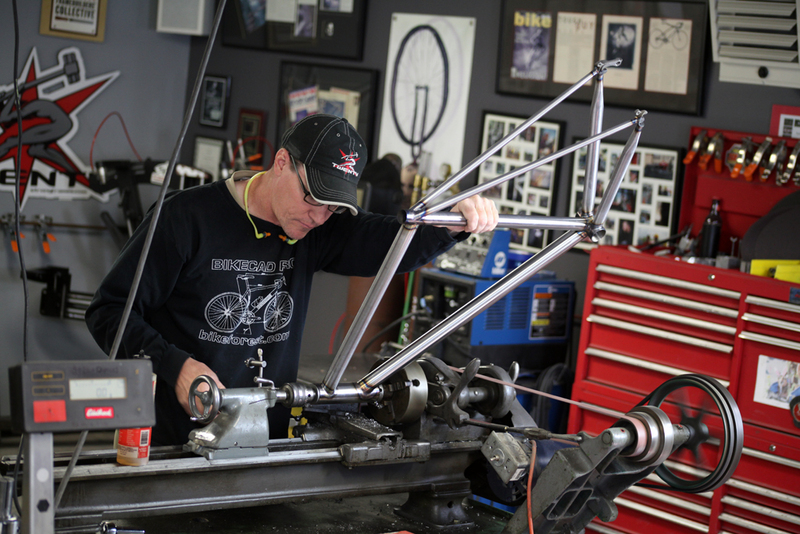 Bicycles and Frames are carefully packaged to prevent damage during shipping (but they are insured just in case). 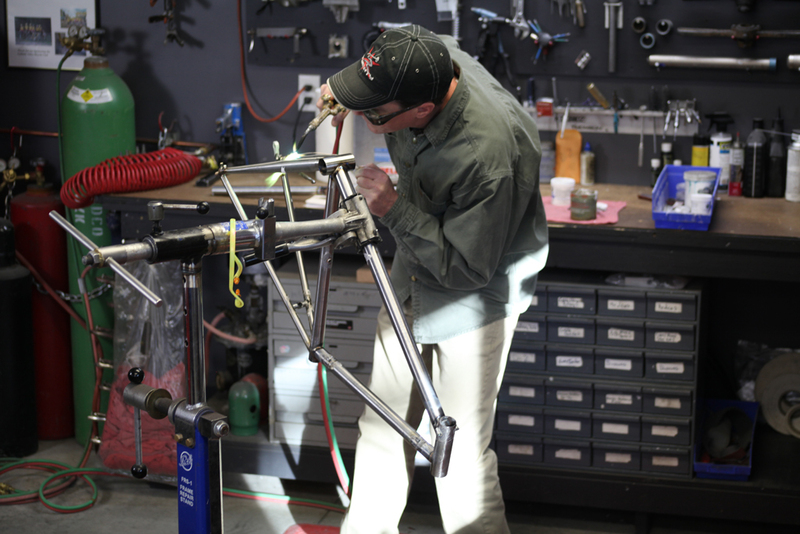 When ordering a frame only, it will arrive “Pro Prep’d” so that it is ready to assemble.